It is becoming a bit of an on-again off-again ritual here in New Zealand, having Christmas in the summer sun and escaping into the shade of the movie theatre to enjoy a Peter Jackson Hobbit flick, and luckily 2013 is no exception. Next Tuesday, The Hobbit: The Desolation of Smaug premieres in Los Angeles, and for a few lucky attendees, they can fly to L.A. on the angry antagonist himself. 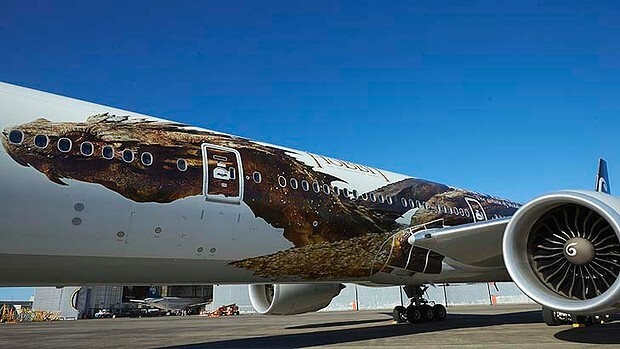 Smaug has finally been revealed in full, thanks to Weta Workshop, at 54 metres in length, along the side of a Air New Zealand Boeing 777-300. Yes, Air NZ is the same airline who Tolkien-ised their inflight safety video. Look at him! Seeing Smaug 'chase Hobbits' in the skies between New Zealand and California is going to redefine 'wicked'! This would look really nice parked next to our Optimus Prime truck, and the TARDIS. Land, sky and the space time continuim - nicely sorted Random! I like to cover my bases.